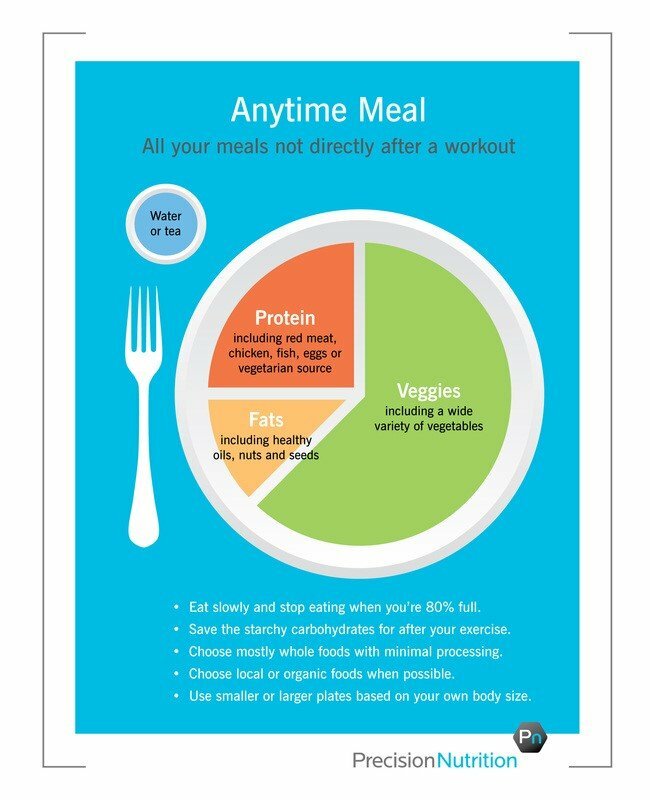 Are you confused about how to construct a meal that will help you reach your health and fitness goals? Read on, because I have 4 simple steps that will help you create a delicious meal you can eat anytime. 1. Protein – add a palm sized portion of lean protein. Your options are limitless and can include chicken, salmon, tuna, lean beef (preferably grass fed), an omelet, turkey burger, bison, or any other protein that you enjoy eating. 3. Fat – yes, I said it – Fat! Adding a healthy fat to your meal will help to keep you full longer, will help you digest your food better and will actually help to promote fat loss. Some options are to add a thumb sized amount of healthy oil to your cooking methods. These can include olive oil, coconut oil, organic butter, palm oil or ghee. Your fat portion could also include raw nuts, olives, or avocados. 4. Water or Tea – Removing calorie and sugar heavy beverages is a great idea to improve your health and fitness goals. Add a tall glass of water before, during or after your meal instead of soda, milk or juice. I'm a wife + adoptive mama who loves Jesus, coffee, kettlebells + dark chocolate. I teach women how to grow a stronger faith, raise a stronger family, and build a stronger body. Join our email community for a safe place to grow a stronger faith, family & body. You will receive weekly encouragement straight to your inbox, plus exclusive access to my resource library of faith + fitness printables.